Excitement is building around the world as the Philae lander, part of ESA’s Rosetta mission, prepares to touch down on the surface of Comet 67P/Churyumov-Gerasimenko. As part of the Spatial Awareness series, Cardiff University’s Chris North chatted to Oxford’s Becky Smethurst and QUB’s Alan Fitzsimmons – currently on top of a mountain in Chile preparing to observe the comet with one of the largest telescopes on the planet. 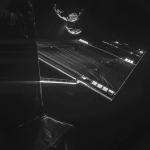 Watch the video below, and don’t forget to keep up with Rosetta, ready for Philae’s landing event on 12 November!